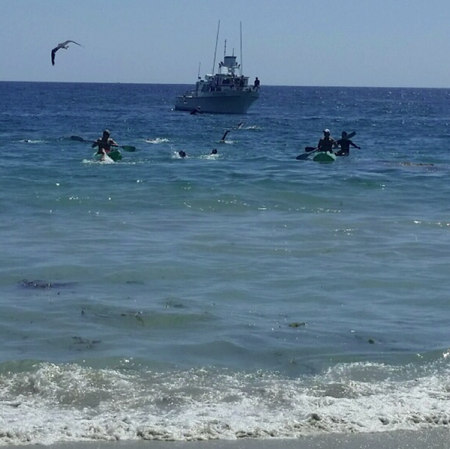 Despite strong winds and choppy seas, the open water swimmers and support team 33.5 Miles Across the Sea reached their home shore at Main Beach Saturday, Aug. 8 just after 3 p.m., which they believe is the first channel crossing from Catalina Island to Laguna Beach. Their unofficial time was 19 hours 44 minutes. Swimmers and support kayakers complete a Catalina crossing Saturday, Aug. 8, from left, Faith Hale, Jamie Glazer, Lynn Kubasek, Thomas Hale, Patsee Ober, Rich Selin, Brett Rose, Eric Zuziak and Roddy Teeple. Photo by Charlie Craig. The six-person relay team from Laguna Beach, also known as Halestorm, swam in the inky darkness of a moonless night across a shipping lane and against a strong current while ignoring stings by jellyfish. Organizer and swimmer Tom Hale described a “gnarly start” and veteran swimmer Lynn Kubasek, diving in for her fifth Catalina Channel crossing, said she felt “apprehensive” about the current pressing against them. Team member Brett Rose called the experience “really grueling” and said it was like “swimming in place” at times. The other relay team members include Hale’s daughter Faith Hale, Patsee Ober and Roddy Teeple, who were assisted by support kayakers Eric Zuziak, Rich Selin and Jamie Glazer. After a supper of pasta and salad and a recitation of the Catalina Channel Crossing Federation rules by certified observers Catherine Coy and Dan Simonelli, the relay team splashed off Friday, Aug. 7, from Long Point, just north of Avalon. They ventured into the water at 7 p.m., two hours before their planned departure on the advice of John Pittman, captain of a support vessel, The Outrider. Pittman has navigated over 150 swims across the Catalina Channel. 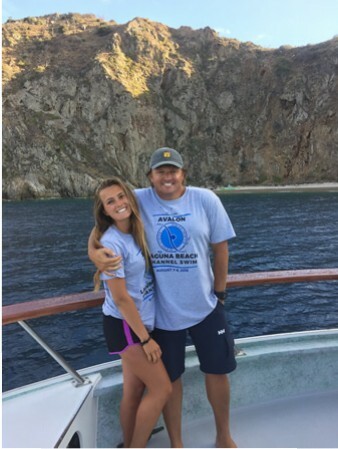 Tom Hale and his daughter Faith on board a support boat offshore Catalina Island last Friday, Aug. 7. Photo by Roddy Teeple. Two other relay teams in 2012 and 2009 also completed the channel crossing from Catalina, aiming for the closest mainland shoreline 29 miles away in Long Beach and San Pedro with times of 13.25 hours and 8.75 hours, respectively, according to the federation’s website. Since 1926, 108 teams and 321 solo swimmers have accomplished the feat with times ranging from under eight hours to more than 33. Regardless of a swimmer’s preparation, water temperature and current strength and direction also influence the duration and success of a crossing. But federation records make no distinction for where solo channel swimmers or teams make landfall. Team Halestorm established their own finish line in Laguna Beach, a crossing of 33.5 miles from Long Point. First in the water for Halestorm was Rose, who swam to touch the rocky shore before the race officially began. Dolphins and seals swam alongside him during his first one-hour leg. Tom Hale pulled off his Jaws t-shirt before jumping in to swim the second leg. Teeple, Hale’s daughter Faith, Kubasek and then Ober, followed, each swimming one-hour legs in succession three times. Rose and Hale each swam a fourth hour. Between turns in the water, the team slept, danced to Lynrd Skynrd and Santanna, nursed some jellyfish stings and re-fueled from a full galley. Teeple said the initial jellyfish encounter felt like brushing up against a prickly bush, with one sting more powerful than the others. “That one hurt!” he recalled. Ober was stung in several spots and Tom Hale wasn’t spared either. If they had gotten out of the water, though, the race would have been over. “You just have to keep swimming,” Ober explained. The last swimmer strokes for landfall on Main Beach while The Outrider remains outside the surfline. Photo by Elizabeth Hale. Crossing the four-mile wide shipping lane at 4 a.m., Faith Hale swam within a mile of a cruise ship, but her dad reported that the few other large vessels they encountered in the channel posed no risk to the swimmers other than kicking up a large wake in their direction. At the relay’s conclusion, the swimmers were welcomed back to dry land by a joyous crowd of well-wishers tooting air horns on Main Beach. After posing for pictures, unbelievably the team returned to the water and The Outrider, which headed to its home port in San Pedro. The team later celebrated its feat at Zuziak’s home. On Sunday, Hale recounted the journey on the KX 93.5 radio show “Coast Highway Shuffle,” while Ober returned to her booth at the Sawdust Festival despite welts from jellyfish stings. 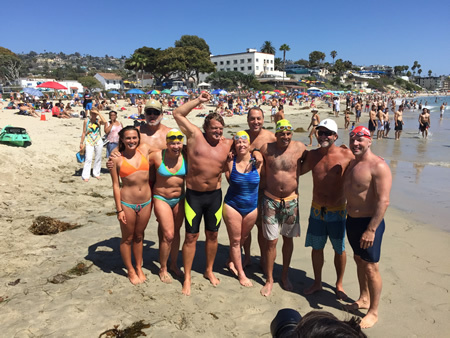 Halestorm’s crossing to Laguna Beach will be recorded in the Catalina Channel Crossing Federation logbook as will Faith Hale’s achievement as the first female lifeguard from Laguna Beach to make the relay from Catalina to Laguna Beach.